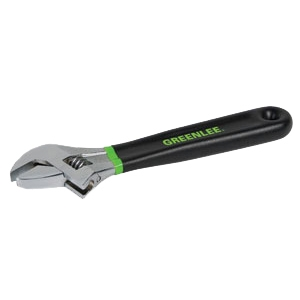 Adjustable Wrench features heavy-duty construction to handle any size job. Double-dipped vinyl handle for user comfort and slip resistance. Precision-machined to tight tolerances for professional feel and smooth operation. Wide capacity jaw design provides extra versatility. Measuring scale on head for easy sizing. Corrosion-resistant finish. Exceeds ASME/ANSI specifications. Lifetime limited warranty. This is not an insulated tool.